The modern day fairytale princess had a make over in the Shrek movie series and thus sparked great interest in Princess Fiona costumes. These costumes vary in detail and accessory, but rarely is the character confused with any other. Princess Fiona is the fairytale princess featured as the damsel in distress in the Shrek movies. The first movie premiered in 2001, the largest premiere to that date of any Dreamworks production. Having been banished to a tall tower because of her curse of being an ogress at nightfall, Fiona patiently waited for her Prince Charming to come, break her spell and whisk her away to a happily ever after ending. However, Shrek appeared instead, much to her initial dismay. Through their travels, Fiona and Shrek fell in love and her spell was broken with a kiss, causing her to be an ogress permanently. Fiona is characterized as being feisty, smart and an extremely capable female. Through their use of computer-generated animation, Dreamworks has positioned itself as one of the premier producers of family entertainment. Aimed at being funny and telling "great stories," Dreamworks attempts to produce two full feature films a year. Having grown from their roots, realizing success with films such as ''Shrek'' and with eyes on the future, Dreamworks promises to produce more films that will catch the attention of the most everyone. All Princess Fiona outfits should include a set of ogre ears and a tiara. Many include a green dress trimmed in gold; however, Fiona wears a variety of dresses in the movie. So, any dress made to resemble her appearances in film would still be appropriate. There are a few options for children available on the Internet. Princess Fiona Children's Costume: The costume includes the headpiece and the dress with the belt. The dress is 100 percent polyester and has an elastic waist back. The cost is $29 and is available in small, medium and large sizes. 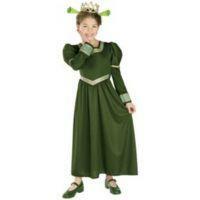 Princess Fiona Children's Deluxe Costume: The costume includes a paisley printed dress with gold trim and headpiece. Also, available in small, medium and large sizes, the costume is priced at $36. Fiona Warrior Costume: This costume features a satin/taffeta skirt. The top is brocaded and the entire outfit includes a stretch waist. Accessories include the tiara and temporary tattoo. The costume, also, features tear-away sleeves. Priced at under $28, this outfit comes in sizes Toddler, Small and Medium. Princess Fiona Deluxe Adult: An officially licensed Shrek costume, this is available in sizes eight to 12. The gown is green, full-length and features gold accents. The headpiece consists of ogre ears and crown. The cost is $50. Shrek, the Third, Deluxe Princess Fiona: Different than many of the Princess Fiona costumes featuring the green gown, this costume includes a once-size-fits-all purple and white gown accented with silver. The crown features the ogress ears, as well. This is available for around $45. No Princess Fiona is complete without her flowing red hair. Wigs are available on various websites, including www.costumecraze.com for under $14. Of course, there are lots of other places to look online or shops to browse through in person. Additionally, you can go to your local crafts store and purchase a pattern to make your own costume. Princess Fiona is not complete without her loyal husband, Shrek. Consider going with a friend who is willing to dress up as Shrek. This will add authenticity to your presentation and create more enjoyment for both. Going as a couple can make the whole experience even more memorable. Shrek is such an endearing movie, it appeals to most everyone. Having been in the media so much lately, characters from the movie are automatically recognizable. By dressing up as Princess Fiona, you're not only making a statement that you like the character, but that you admire her strong, leading qualities. Although an ogress, she is quite the role model for many women.